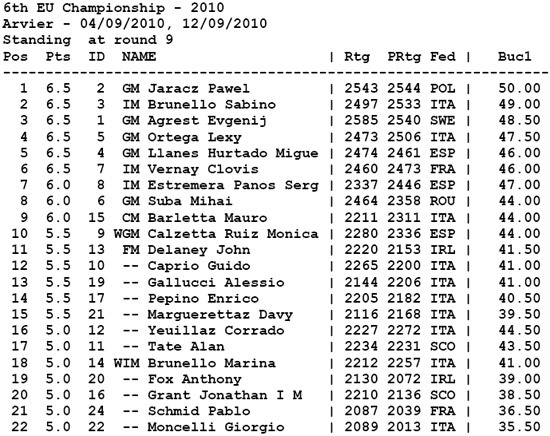 GM Pawel Jaracz won the 2010 EU Champion title at the 6th EU Chess Championship in Arvier, Italy. He collected 6,5 points, the same as IM Sabino Brunello, GM Evgenij Agrest, GM Lexy Ortega, GM Miguel Llanes Hurtado, and IM Clovis Vernay, but won the gold on better tiebreak. WGM Monica Calzetta Ruiz, who is part of the Spanish Chess Olympiad 2010 team is the women EU Champion. She finished with 5,5, first among women participants and 10th overall.